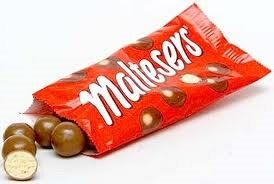 Maltesers are a confectionery product manufactured by Mars, Incorporated. Maltesers consist of a roughly spherical malt honeycomb centre, surrounded by milk chocolate. Maltesers are sold in a variety of packaging, including plastic bags (ranging in size from small 'fun-size' upwards), larger cardboard boxes and tubes, and plastic buckets (ranging in size from medium to very large). They also have medium sized "teasers" in Celebrations boxes. Maltesers are also one of the types of sweet included in Mars's Revels assortment.